The son of a blacksmith becomes a major-league baseball player, and then a medical doctor. This quintessential American success story belongs to Merle Theron Adkins, who was born in Troy, Wisconsin on August 5, 1872. He was the son of Susan and Emery Adkins. While growing up, Merle was known as Addie or Babe or Tommy. Beloit’s physical trainer, Jack Hollister, is credited with helping develop Adkins’ pitching talent. The student’s work on the mound caught the attention of Henry J. Killilea, the owner of the Boston Americans ball club, who signed Adkins to his team in 1902. A May 6, 1902, Boston Globe story dubbed Adkins “the best box artist the Midwest has turned out in many years and the mainstay of the Beloit college team,” and said he would report to the team after graduation. In one of his last games as a collegian, Adkins struck out 13 Notre Dame batters. He joined Boston on June 15. Paul W. Eaton used some colorful language to describe Adkins’ June 24 debut, when he came on in relief of George Winter in a road game in Washington: “Young Adkins, the Beloit College twirler, succeeded him. ‘Tommy’ was guyed at first, as his shape suggests Cupid Childs after a meal of dried apples, water and wind, and his motions were very coochee-coochee. Adkins was an Old Sleuth mystery to the Statesmen and held them down to two hits. He refused to get rattled and his style soon caught the push, who rooted for the kid. Adkins seems to be a Thos. J. Loftus find.”ii Washington won the game, 7-6, despite Boston’s five-run eighth-inning rally. Adkins was 1-for-2 in the game, stranded on base after a single in the seventh. His next start, on July 2, was a poor one. He only lasted one inning, surrendering three runs in a home game against Washington, which never relinquished its lead. Adkins stood 5-feet-10 ½ inches and his listed playing weight was 220. Sporting Life commented on his body shape with a blunt one-liner in its “American Affairs” column: “Manager Collins should run about 30 pounds off fatty Adkins.”vi His pitching had left a lot to be desired – he’d thrown 20 innings and given up 20 runs (fortunately for his earned run average, only nine were earned runs), in large part due to 30 hits and seven bases on balls. When the Bostons left for Philadelphia in mid-July, neither George Prentiss nor Adkins joined the traveling party. Oddly, on July 12 – while the Bostons were in Philadelphia – Adkins pitched in a game at the Huntington Avenue Grounds. He joined the West Quincy team playing against the Dorchesters in a semipro game at the American League park. He entered the game in the seventh inning and was 0-for-1 at bat; West Quincy lost the game, 5-4. Some 2,700 people turned out to take in the game. He moved to a team in Rockland, Massachusetts, but almost immediately signed with the Milwaukee Creams (a Class A Western League team managed by Hugh Duffy).viii His first game for Milwaukee, at the Lloyd Street grounds, was a six-hit, 3-0 shutout of Peoria. The Milwaukee Sentinel wrote that he was “accorded the greatest ovation that has been extended to any player in years past in this city. The old gladiator for Beloit’s Gold came heralded as a wonder, and he made good in every department of the game. His pitching was without a flaw, he batted in good form, he scored the first run of the game and he was the principal in one of the prettiest bits of fielding ever seen on the grounds.”ix He appeared in 16 games for Milwaukee in 1902. At some point in October, Adkins signed to pitch in 1903 for the New York Highlanders. He began the ’03 season with New York, but by July 11 he had made his way to Baltimore. He pitched a six-hit, 2-0 shutout of Newark in a road game with his new team. On September 26, he was recalled to New York, and pitched two games, including his final game in the major leagues, in which he went just three innings, giving up five runs to the Tigers. 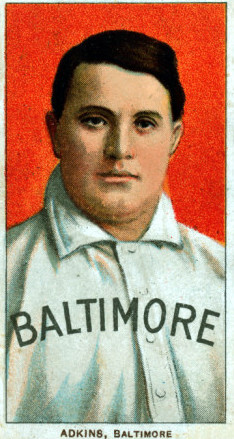 Adkins took a position coaching baseball for Johns Hopkins, but on March 17, 1904, he signed with the Baltimore Orioles again. No pitching stats are available for 1904, but in 97 at-bats, he hit for a .278 average. It was an exception; his career minor-league average was .185. He began to study medicine at Hopkins, and predictably picked up the nickname “Doc.” He married Florence Tragler on October 4, 1904. In 1905, the second of nine seasons he pitched for the Eastern League Orioles, Adkins had a very good 18-9 record. He joined pitchers Burchell and McNeal in holding out in the spring of 1906, a “strike” in the words of some. The parties arrived at a satisfactory resolution. He graduated from Johns Hopkins in 1907, but kept right on pitching. One interesting note: manager Jack Dunn protested a July game with Buffalo, on the grounds that the ball had been doctored with oil of mustard to prevent Adkins from throwing the spitball. The protest was not honored.x Adkins was effective nonetheless; he had a 16-15 season in 1906, and became a 20-game winner in 1907 (20-11). He hit his peak with a 29-12 record in 1908, and went 21-19 in 1909. Over the next three seasons, however, he was a cumulative 28-31. Somehow, Doc Adkins managed to balance his medical practice, coaching, and pitching. As the February 15, 1908 Sporting Life explained, “Dr. Merle Adkins, the Baltimore pitcher, has resigned his position on the house staff of the Union Protestant Infirmary, of Baltimore, to accept the position of base ball coach of Trinity College, Durham, N. C., from February 1 to the latter part of April.” That same year he won 29 games the Orioles. Trinity later became Duke University. Finally, medicine became his fulltime profession, and he worked in Durham as a doctor until his death from coronary heart disease on February 21, 1934. The Baltimore Sun reported that he had “added to his already great weight” and had sought diet treatment under a specialist at Johns Hopkins.xiii He’d had a heart attack two weeks earlier and then a series of attacks on his final day. He had been active in the Presbyterian Church and the church choir, and taught a youth Bible class. His wife, Florence, and four sons (Merle, Fenton, Emery, and Tragler) survived him, as did his mother and a sister. In addition to the sources noted in this biography, the author also accessed Adkins’ player file from the National Baseball Hall of Fame, the Encyclopedia of Minor League Baseball, Retrosheet.org, and Baseball-Reference.com. i Unattributed news clipping from Adkins’ player file at the National Baseball Hall of Fame. ii Sporting Life, July 5, 1902.
iii Boston Globe, June 27, 1902.
iv Sporting Life, July 19, 1902.
v Boston Globe, July 9, 1902.
vi Sporting Life, July 12, 1902.
vii Sporting Life, July 26, 1902.
viii The same August 2 issue of Sporting Life reported both events. ix The quotation from the Sentinel ran in the Boston Globe of August 4, 1902.
x Sporting Life, July 13, 1907.
xi Sporting Life, August 1, 1908.
xii Sporting Life, June 18, 1910.
xiii Baltimore Sun, March 3, 1934.